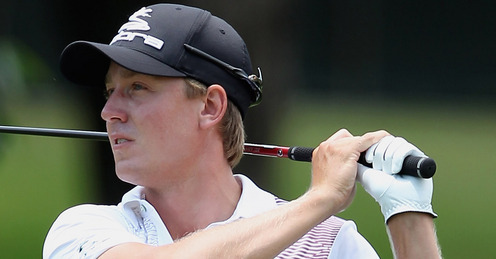 Jonas Blixt overcame a four-shot deficit on a rain-filled Sunday at the Old White TPC to claim the 2013 Greenbrier Classic. Play was delayed on Sunday for three hours, with the last pairing of Johnson Wagner and Jimmy Walker not getting a chance to tee off before the rain halted play. Wagner held a two-shot lead over Walker when the two went to the back-nine, but three bogeys on the back side by Wagner opened the door for others, including Steven Bowditch, Matt Jones and Blixt. A birdie on 16 by Blixt put him two shots clear of the final group, and that’s where he would stay, winning by two shots for his first win of 2013. In his post-tournament interview with David Feherty, Blixt was extremely emotional, talking about how it’s been a tough year for him performance wise and how he was happy that he was going to be able to go home and see his family. We talk a lot about players like Tiger Woods and Graeme McDowell, who won today in France, but wins like this for Blixt, much like for Ted Potter Jr last year, are huge difference makers in their careers. Yes, he won the Frys.com Open last year in the Fall Series, but this is slightly bigger for him. The win gets him into the Masters for the first time, he’ll be off to the Open Championship in two weeks at Muirfield, and the win should get him enough FedEx Cup points to get into the FedEx Cup Playoffs. Not to mention the just over $1 million in prize money isn’t too bad for him either. As mentioned above, inclement weather delayed action today for about three hours, which if you’ve been following the PGA Tour this season, you know that this has become a prominent theme all year. To go along with that, the PGA Tour has in most cases decided to risk it and not move up the schedule or go off of split tees, mostly in an attempt to keep the TV schedule in place for a regular Sunday 3-6 PM ET slot on either CBS or NBC. The problem with that is when tournaments get delayed like they did today, you end up potentially having a Monday finish, which puts the players in a really tough spot, especially those who have Monday qualifiers or other commitments to get to. Apparently Greenbrier owner and tournament chairman Jim Justice may have stepped in and demanded that they stick to the schedule, even after the PGA Tour suggested moving up the times due to the threat of bad weather. If that’s the case, it seems kind of ridiculous that the PGA Tour would be forced to do something that they didn’t want to do, especially when this isn’t exactly the Masters or even a non-major that most players take seriously. The quality of the field, despite what CBS will try and push on you, was pretty awful, with Louis Oosthuizen being the only name within a sniff of the lead that had any kind of professional pedigree. You don’t want to piss off the tournament organizers, but nobody wins when events end up going this way, especially the players and the PGA Tour. Tom Watson is 63 years old, and by all logical thinking, he should not be making cuts anymore on the PGA Tour. He’s supposed to be a novelty item these days, a guy that CBS shows a couple of times on the broadcast just because of his name value, but this week he showed that every now and then, he can still compete. He finished tied for 38th after a final round of 3-under par 67, and as Tony Jacklin said on Sky Sports this morning, he really is the game’s best example at the moment of a living legend. He’s going to be playing at the Open Championship at Muirfield in a few weeks, and will also be heading to Oak Hill for the PGA, in preparation for his Ryder Cup captaincy next year. Notables to miss the cut: Chris DiMarco, Sean O’Hair, Ryo Ishikawa, Scott Piercy, Charles Howell III, Brian Gay, Lucas Glover, Phil Mickelson, Ricky Barnes, Mike Weir, Vijay Singh, Boo Weekley, Kyle Stanley, Bud Cauley and Jesper Parnevik. Notable finishes: Ted Potter Jr (T6), Davis Love III (T9), Louis Oosthuizen (T17), K.J. Choi, Scott Stallings, Nick Watney and Jordan Spieth (T23), John Senden, Bubba Watson, Billy Horschel, Graham DeLaet, Russell Henley (T30), Michael Kim (T38), Kenny Perry and Webb Simpson (T41). Two WD’s this week: Peter Hanson pulled out during the rain delay on Sunday, which prompted some to suggest that he was doing it because he didn’t want to come back on Monday, but he also pulled out on Saturday from the John Deere, so something’s definitely up with him. He’s still hoping to play at Muirfield in a couple of weeks. John Daly was the other WD with an elbow injury, and he tweeted after the round that he was going in for surgery and it’ll keep him out of action for the next 3-4 months. That means no Open or PGA for Daly, who is still exempt for those two majors based on his wins at Crooked Stick (1991 PGA) and St. Andrews (1995 Open). Your latest example of golf making no sense: Coming into this tournament, Johnson Wagner had seven starts on the PGA Tour in 2013. His results? Six missed cuts and a WD. I’m sure that CBS was thrilled to have their broadcast crew working and commentating on a Golf Channel/NBC production. Three (reported) appearance fees paid by Justice to Phil Mickelson have led to three missed cuts by Lefty. Not exactly getting the most out of your investment there.